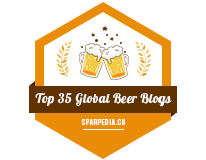 2017 is almost over and if I had to put out a list of my top up and coming Canadian breweries, Malty National Brewing Corporation would easily make my top five. This Regina, Saskatchewan based brewery consistently makes amazing beer, batch after batch ever since they opened in April 2016. 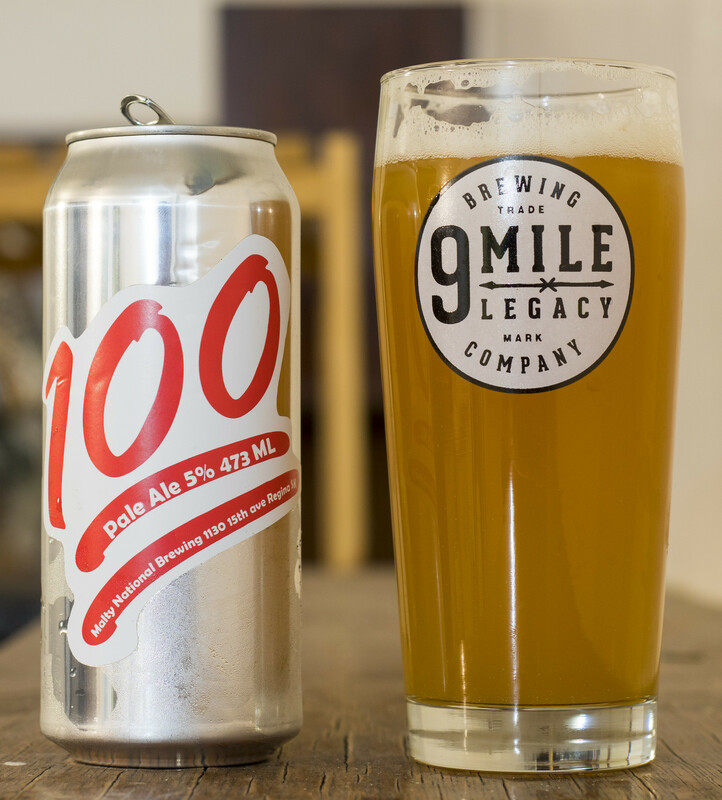 I visited Malty National while I was on my way to Saskatoon for a friend's wedding and they happened to be stickering cans of their 100 Pale Ale, which is their 100th batch of beer they've made so far. Their owner/head brewer Adam (who I think of as of Milhouse grown up and happens to own an awesome brewery) sent a can with me right before I was on my way for the long drive to Saskatoon. I also picked up their Mosaic and New Money Pale Ales in growler form just in case I wasn't able to make it back the brewery in time to get a growler fill on my way back to Manitoba (I wasn't). I should've had this can of 100 Pale Ale a month ago, but as I've said in every other review lately.. yep. Appearance: I had to use a 9 Mile Legacy glass for this beer because Malty National was sold out of branded glassware, but I absolutely love the 9 Mile Legacy glass.. so I'm using it for most non-review beers. The beer pours a thick, cloudy, orange juice-like beer that has the typical Malty National branding to it. Malty National is passionate about brewing thick, juicy beers that remind me of New England, and this is no exception. It starts off with a few fingers worth of beige head on top, but it gradually diminishes to just a quarter finger's worth of film with the rest of the foam being on the side of the glassware. The photo doesn't really do the beer justice because the lighting is craptacular at night. Aroma: OATS! The thing I love about Malty National's beers is that they seem to use oats for just about every single beer they've ever made.. and the thing is that it works. Oats gives this beer the trademark Malty National aroma to it as the very first thing I get from here is the aroma of when I used to have to clean out my dad's oat grainery as a kid. There's tropical notes of pineapple, orange, lemon, and a hint of pear. The thing I love about beers like this is that if I was blindfolded, I could swear that this is actually some sort of juice from the grocery store rather than a beer. Taste: The oats give this beer the most dominant flavour, giving it a grainy, cereal flavour. It's somewhat grassy but again.. it's quite tropical in flavour with the typical juicy IPA/Pale Ale flavours like orange and pineapple. The fruity, tropical flavours are definitely not as powerful as in the aroma but it does make its way into every sip. Overall Thoughts: Typical Malty National beer, it's full of oats, hazy as heck and lots of tropical notes. 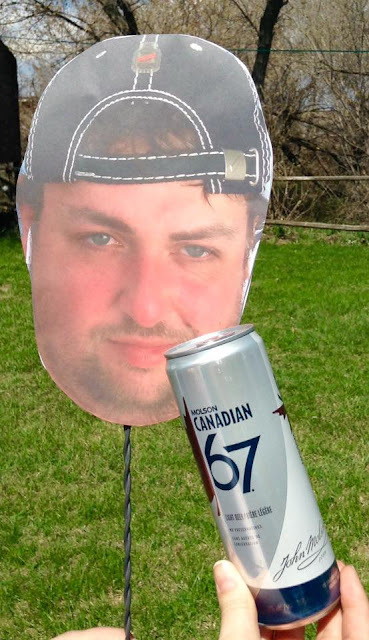 I probably won't be back in Regina for another 6 to 8 to 10 months, so I wish I had more of all their beers. If you're ever in Regina, you have to check out Malty National Brewing, it's a great local community brewery in a quiet residential part of the city.